NETWORK FINALS: The GRAMMY AWARDS adjusted to 5.6, down 0.3 from 2018’s final number. In addition, THE SIMPSONS lost 0.1 in final numbers. CABLE HIGHLIGHTS: NOTE: many shows took last week off due to the Super Bowl, so except where noted, comparisons are to 2 weeks ago. 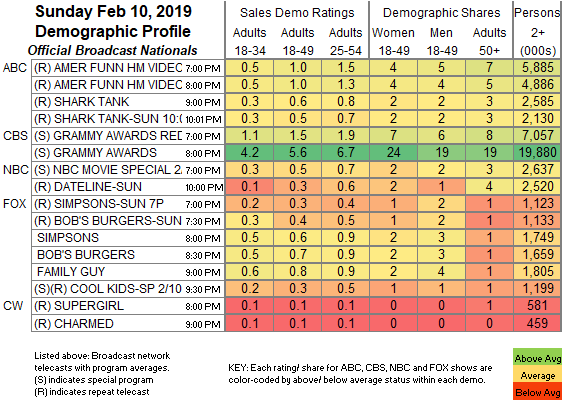 Showtime’s SHAMELESS returned from its Super Bowl break up a tenth to 0.40, BLACK MONDAY slipped 0.02 to 0.09, SMILF ticked down to 0.06, and THE CIRCUS was up 0.01 from last week to 0.06. HBO did air against the Super Bowl, and TRUE DETECTIVE gained a tenth to 0.34 (although that was down a tenth from 2 weeks ago), with CRASHING steady with last week at 0.11 (down 0.03 from 2 weeks ago), and HIGH MAINTENANCE down 0.03 to 0.06 (down 0.02 from last week). Adult Swim’s TIGTONE was at 0.32/0.27, compared to last week’s 0.33/0.29. Starz’s now-canceled COUNTERPART ticked down from last week to 0.06. Bravo’s REAL HOUSEWIFES OF ATLANTA led unscripted, down 0.18 from 2 weeks ago to 0.65. Food Network’s WORST COOKS IN AMERICA rose 0.09 from last week to 0.45. Fox Sports 1’s NASCAR race was at 0.42. On E!, the GRAMMYS RED CARPET special was at 0.39, and TOTAL BELLAS ticked up to 0.20. HGTV’s line-up was led by CARIBBEAN LIFE at 0.36/0.33, compared to 0.35/0.33 2 weeks ago. 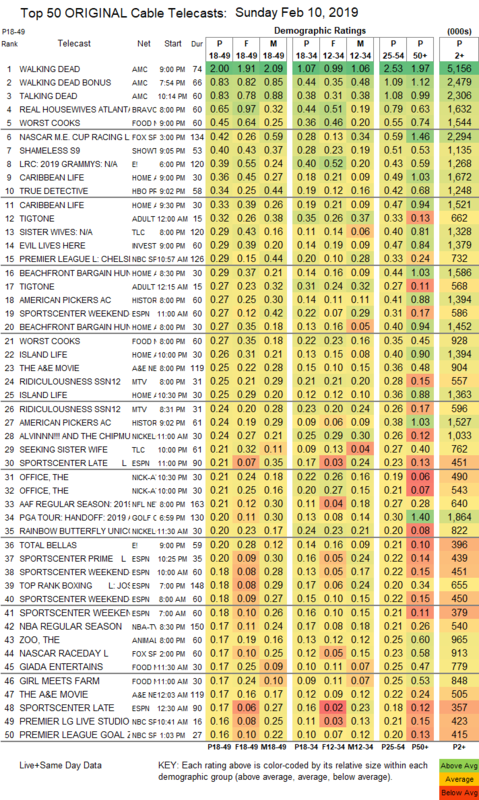 On TLC, SISTER WIVES dropped 0.08 to 0.29, and SEEKING SISTER WIFE was down 0.06 to 0.21. ID’s EVIL LIVES HERE lost 0.07 to 0.29. NBC Sports Net’s PREMIER LEAGUE match was at 0.29. MTV’s RIDICULOUSNESS was at 0.25/0.24.